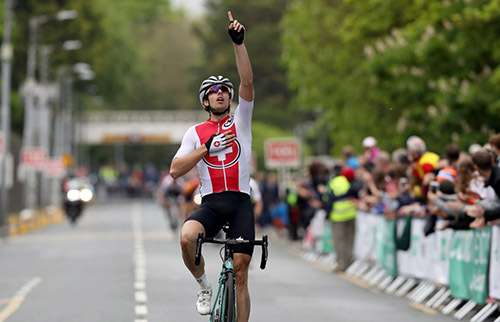 Attacking from the day’s break with approximately a kilometre to go, Swiss national team rider Cyrille Thiery soloed to victory at the end of stage 1 of the Rás Tailteann on Sunday. The 27-year-old rider raced into Athlone four seconds clear of his nine breakaway companions, with Luuc Bugter (Netherlands Delta Cycling X), Robbe Ghys (Belgian National Team), Jason van Dalen (Netherlands Delta Cycling X) and Dexter Gardias (Britain Canyon Eisberg) completing the top five. Jake Gray (Ireland National Team) in sixth and Damien Shaw (Ireland Holdsworth Pro Racing Team, 10th) were best of the home riders, while Gray’s teammate Robert-Jon McCarthy (Ireland National Team), best county team rider Matteo Cigala (Westmeath Viner-Caremark – Pactimo) and Paidi O’Brien (Dublin Team Gerard DHL) led in the main bunch some 23 seconds back. The stage began at 12.30 in Drogheda and covered 136 kilometres to Athlone. The day’s first climb was at Slane, 13.7 kilometres after the drop of the flag, and here Thiery signalled his strength to his rivals when he beat Lindsay De Vylder (Belgian National Team), Daniel Coombe (Wales Racing Academy – National Team) and Robert-Jon McCarthy (Ireland National Team) over the prime line. Thiery remained active and soon afterwards was involved in a break of 11 riders. These also included Bugter, Ghys, van Dalen, Gardias, Gray and Shaw, as well as William Harper (Britain Saint Piran Elite Cycling Team), Claudio Imhof (Switzerland National Team), John Harris (USA CCB Foundation – Sicleri) and Benjamin Wolfe (USA Jelly Belly P/B Maxxis). Recognising the danger, four others set off in pursuit, namely Conn McDunphy (Ireland Holdsworth Pro Racing Team), Adriaan Janssen (Netherlands Delta Cycling X), Fintan Ryan (Cycling Leinster), Seán Hahessy (Westmeath Viner-Caremark – Pactimo). The aggression helped add to the average speed, which saw the riders cover 44.7 kilometres inside the first hour of racing. After approximately 49 kilometres of racing the four chasers were caught by the bunch. Out front, Harris was dropped, leaving ten riders ahead. That group increased its lead to 55 seconds after approximately 58 kilometres, but chasing by the Germany Bike Aid hacked this down to less than 30 seconds. The gap hovered around that mark for quite some time, giving the impression that the bunch was playing with the break. However the leaders knuckled down and extended it to one minute and 25 seconds with just under 90 kilometres of racing done. Shortly before that point, Shaw won the Hot Spot sprint in Rochfortbridge (km. 84.4). He beat Wolfe and Gray to take the bonus seconds where, while slightly under four kilometres later Thiery beat Shaw and Wolfe to take the mountain prime, also listed as Rochfortbridge (km. 88.1). Shaw then won the second Hot Spot sprint in Kilbeggan, 99.4 kilometres into the stage. The bonus seconds he gained would see him end the day third in the general classification. “It was a typical start,” he said afterwards, explaining how the move developed. “It was fairly fast, frenetic. A lot of different attacks going. To be fair, I was with a lot of stuff and just in the right one that stuck. The gap came right down to 20 seconds at one stage. I thought about maybe sitting up, but why would you really on home turf? Behind the break, Robert-Jon McCarthy (Ireland National Team), Matthew Nowell (Britain Canyon Eisberg) and Sjoerd Bax (Netherlands Delta Cycling X) realised the bunch wasn’t working well in pursuit of the move. They clipped away and started a chase, closing to within one minute and 20 seconds of the leaders. However the bunch then accelerated and hauled them back. Several others then jumped away from the peloton but Seid Lizde (Ireland Holdsworth Pro Racing Team) and Adriaan Janssen (Netherlands Delta Cycling X), plus the chasing duo of Rory Townsend (Britain Canyon Eisberg) and Nikodemus Holler (Germany Bike Aid) were also unsuccessful in their pursuit. These were caught by kilometre 107, and four kilometres later – the 25 kilometres to go point for the stage – the gap to the leaders was one minute 20 seconds. The peloton increased the pace as the finish approached, with the Germany Bike Aid and Britain Canyon Eisberg squads combining to try to drag the peloton back up to those out front. However the break was pulling well together and their collaboration prevented the gap coming down as quickly as it needed to. With five kilometres left the break still had 46 seconds at hand, and the bunch ran out of time to get it back. As the finish line approached the attacks began. Thiery was feeling strong and timed his move to perfection, clipping away with approximately a kilometre left and racing in to the finish four seconds clear of Bugter, Ghys, van Dalen and the others in the break. He ended the day snugly in the yellow jersey of race leader, holding a ten second lead over Bugter and 11 seconds on Shaw. Ghys is fourth overall, with Irishmen Gray in seventh and McCarthy in 11th. Thiery’s stage win saw him take the lead in the points classification, while his two victories in the King of the Mountains prime saw him also end the day atop those standings. 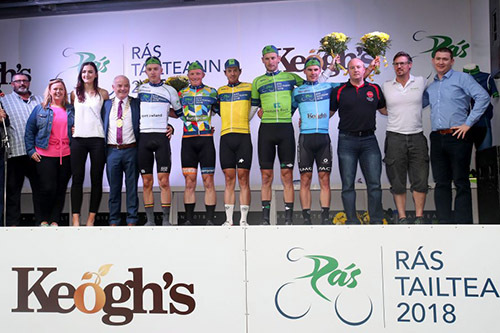 Ghys is best under 23 rider, Cigala heads the county rider standings, and Raymond Cullen (Tipperary Panduit) is best of the category 2 competitors. Switzerland tops the team standings and Kerry Tralee Manor West is best Irish county team. The race continues on Monday with a 148.7 kilometres stage from Athlone to Tipperary. This features the category two ascent of Bikepark just over an hour after the drop of the flag. The category three climbs of Dolla (km 88) and Silvermines (km 92.1) follow before a flat, fast run in to the finish.